Hemp jewelry is being worn by everyone! 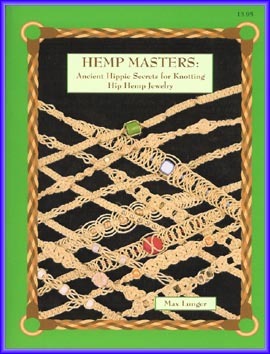 The Hemp Masters knotting manual is a simple, easy to follow, instructional guide to creating outstanding chokers, bracelets, anklets and car mirror charms. This is not just a project book, it is a complete knotting guide which gives the reader tools for creating their own patterns. With market tested patterns and a little hippie humor, this guide will keep crafters smiling as they learn. And as the author says, If you enjoy doing something, you do it well. If you enjoy learning something, you learn it well. This book has an abundance of illustrations and photographs to complement the clear, comprehensive instructions. The introduction has definitions of terms and facts about hemp. How To Begin details deciding how long to cut the hemp and how to start tying a piece of hemp jewelry. There is also a section of Helpful Hints for working with and knotting hemp cords. The Knotting Guide explains and illustrates the Half Knot, the Half Hitch and dozens of variations on these knots, giving the crafter a plethora of choices for pattern combinations. The use of beads and of endings and clasps is also explained. Knots For Masters presents the Pretzel Knot and Phish Bone pattern; two of the coolest, bank maker patterns ever! Finally, there are 22 example projects, from the simple to the complex, all beautiful, with pictures and instructions for each. Written for both beginning and seasoned crafters, this entertaining volume will prove invaluable for any person wishing to learn more about hemp, knotting techniques, and making irresistible jewelry. A very interesting book and a great gift idea!